The Alternative Guitar Summit, a splendid showcase for accomplished and emergent guitarists as well as to promote collaborations among them, has been happening in New York since 2010, the year of its foundation. This year’s event was divided into three days, each of them at a different venue and encompassing some of the most inventive players in its lineup. On Thursday, Jun 21st, Bill Frisell headlined an evening at Le Poisson Rouge, which also featured guest fellow guitarists Julian Lage, Brandon Ross, Matt Munisteri, and Marvin Sewell. On the day after at Nublu, Adam Rogers, Harriet Tubman, and Dave Fiuczinski dove into a jazz-rock-funk throwdown. The third day, which is the subject of this article, offered a novelty in the program with an eclectic night of cross-generational first-time duos. This exceptional circumstance happened at The Jazz Gallery in Midtown, Manhattan. The first pair of artists on the bandstand was Peter Bernstein and Gilad Hekselman, who silenced the audience with dazzling renditions of jazz standards. They started off with a crystalline interpretation of Horace Silver’s “Peace” and proceeded with “Gone With the Wind”, before which Hekselman switched guitars to give the bass lines a bit more power. The melodic exchanges were absolutely delightful in Monk’s “Ask Me Now”, adorned with Hekselman’s spacious delay effect and Bernstein’s harmonic richness. They closed their magnetic performance with Coltrane’s famous minor blues “Equinox”. The following duo, Joel Harrison (the founder of AGS) and Anthony Pirog, explored the roots of American music with an intense blend of folk, country, jazz, and rock and roll. While Harrison often brought into play bending notes and bluesy riffs, Pirog created gorgeous moments of abstraction, occasionally amplified by noise effects, distortion, and jarring chords. The combination was awesome. Many people left during the five-minute break, missing a great second half characterized by innovation and experimentation. The tart alliance formed by Joe Morris and Matteo Liberatore brought an atonal, highly rhythmic electro-acoustic setting pelted with extended techniques. Electronic drones, percussive wallops, and synth-like ostinatos served to enrich this moody, non-stop adventure. Closing out the night, Rez Abbasi and Jeff Miles delivered a creative show, fusing jazz, classic heavy metal, and progressive rock. The powerhouse duo interchanged passages etched with grooves, weeping laments, and enigmatic dark atmospheres while performing two old pieces from Abbasi, one of them inspired by the late drummer Paul Motian, and a new composition from Miles, exclusively penned for this occasion. 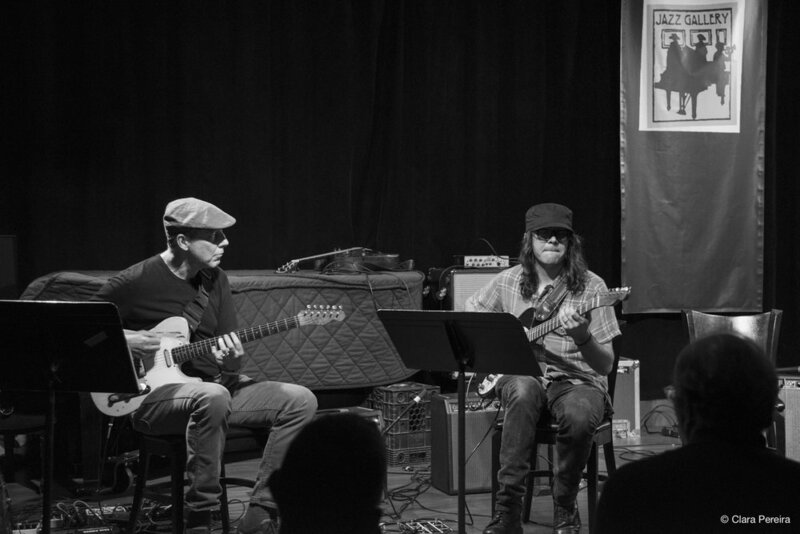 The eight six-string improvisers covered many possible approaches to guitar playing in a sparkling celebration of music that spanned numerous genres.